KISLOC Speaker Wire. Two Channel Speaker to RCA. Split Pin RCA with Silver Tinned OFC Wire. World's First Micro Surface Mount Line Out Converter. K-Series Line Out Converter. OFC Wire for Superior Bass Response and Signal Clarity. Exactly Like New, In Open Manfacutures Box. COMPLETE SET! (Sx1) BOX IN ROUGH SHAPE. Inside every enclosure is our patented Solo-baric L7S square sub. With an average of 20% more cone area than a similarly sized circular sub, the L7S moves more air to create more bass with every note it plays! KICKER KI26 2Ch RCA Signal Cable Wire 6M 19.7ft. Split-pin RCA. Interconnect Cable. Silver-tinned OFC wire. K-Grip line union ultra slim. Complete 4 Gauge OFC CK-Series 2-Channel Amplifier Installation Kit. This Kicker 4 Gauge Power Amplifier Wiring Kit includes all the necessary hardware and wire to power one amplifier and is designed specifically for car audio systems up to 1000 watts. New Kicker 09DPK8 8 Gauge D-Series Power/Ground Car Amplifier Wiring Installation Kit - 100% Oxygen Free Copper. Kicker 09DPK8 8 Gauge D-Series Power/Ground Amplifier Wire Kit. Item Code: 09DPK8. 1 Kicker 09AGU Fuse holder with a 50 amp AFS fuse. KICKER KI21 2Ch RCA Signal Cable Wire 1M 3.3ft. Split-pin RCA. Interconnect Cable. Silver-tinned OFC wire. K-Grip line union ultra slim. KICKER KI25 2Ch RCA Signal Cable Wire 5M 16.4ft. Split-pin RCA. Interconnect Cable. Silver-tinned OFC wire. K-Grip line union ultra slim. 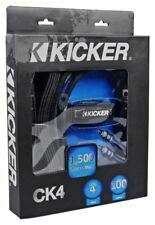 Kicker KW1650 50-Feet 16-AWG K-Series Speaker Wire. Kicker - KW16. Marine Audio. Marine Audio (5178). It all depends on you choosing the right speaker or amplifier for the job and we’re here to make that choice easier for you. Categories: Interconnect Cables / N/A. New Kicker. with 2 RCA (Female/Female) Connectors. K-Grip line union ultra-slim for snag-free cable routing in tight places. Split-pin RCAs with silver-tinned, OFC wire for superior bass response and signal clarity. Kicker CompR DCWR122 (43DCWR122) Open Box. 12" 2 Ohm Impedance CompR Series Subwoofer. Subwoofer Series CompR / CWR (Kicker). Custom Kicker embroidery. Enclosure Features Stamped Steel Basket. Solid wood enclosure. TechnoResearch Harley-Davidson Audio Programing Tool for 2014-Up Harley Davidson Touring Motorcycles. Unlock your Harley's factory stereo settings to get the most out of your Kicker speakers and amplifiers. For Select KICKER CX, CXA, PXA, PX, DX or DXA Series Amplifiers. Up for sale is a new pair of kicker 4" speaker grills covers for KSC models they black. Free shipping thanks. 1" Tweeter cups - "sold by the Pair" Brand new Cups. They were made for 1” K icker resolution tweeters ( R25- R25a- ND25 – ND25a). I thought it was just a few isolated incidents but apparently is a much more common problem that I ever realized. KICKER, that would be up to you though since I can't be checking every tweeter in the world. Kicker Car Audio DB4 Distribution Block Brass Accessories Solid Termination New. Condition is New. Shipped with USPS Priority Mail. Kicker CompR DCWR102 (43DCWR102) Open Box. Custom Kicker embroidery. Subwoofer Features 10" 2 Ohm Impedance CompR Series Subwoofer. Peak: 1600 watts. Subwoofer Series CompR / CWR (Kicker). Enclosure Features. Kicker CK4 Complete 2 Channel Amplifier Install Kit. KICKER complete amp kits feature top-quality Hyper-Flex power, ground and turn-on cables. K Series speaker wire and interconnects are also included, as is a heavy-duty AFS fuse holder and fusing. All factory options, including XM continue to operate! Will work with all current iPod models. - Factory Radio. - Signal Processors. - iPod Solutions. Car Audio Accessories. - UTV Side by Side Speakers. Up for sale is a 10 pin Harness. This harness has Power, Ground, Remote. and left and right speaker input wires. So be sure to try harness to see if fits1st before hooking it up. This list is of known units this harness will work with. All factory options, including XM continue to operate! The GMPD4 works with 5v 30pin iPod versions. Soundgate GMPD4 Chevy Pontiac Saturn Factory Radio iPod Interface Module New. 2007-2008 Saturn Aura. THIS CROSS/OVER CAN BE USE WITH ANY TWEETERS, THEY WORK GREAT. FREQUENCY RESPOND IS 4500 HZ- 21 KHZ IN 4 OHMS. 20 Ft. of 12 AWG Q-Series Speaker Wire. Hyper-flex cable and wire. Twisted-pair technology eliminates noise for crystal clear sound. Jacket can be cut and and the wire split. Kicker Livin' Loud. G10 Subwoofer Speaker Grille. Grille cover look great. I do my best to describe every tiny flaw I see. Included are Power Cable, Ground Cable, Fuse Holder, System Fuses and 2-channel RCAs. Kicker AFS80 80 Amp 2-Pack Platinum-Plated AFS Fuses with Color Coded Casing. Condition is New. Shipped with USPS First Class Package. 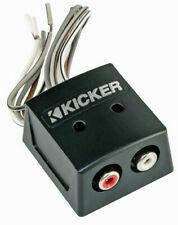 Kicker QI26 2-Channel Q-Series RCA Audio Interconnect Cable Open Box (Complete). 19.7 Ft. 2-Channel Q Series Audio RCA Interconnect Cables. RCA interconnect audio cable. RCA Interconnect Cable Specifications. Solid cast Finished aluminum. never installed. put the number you woudl like in the box - buy it now. Kicker CompC DCWC122 (44DCWC122). 44DCWC122 TA12502 BAK42BL. Peak: 1200W. Thick black carpet with yellow Kicker logo embroidered on the top. 1200W Bridgeable TA Series 2-Ohm Stable 2-Channel Amplifier. For Sale is a Single 6.5 or 6 1/2 Grill For Kicker Speaker 40CS654. Hole to hole: 4-3/8" (center-to-center). Motorcycle Speakers. Car Audio Accessories. Policies & Support. - Electric Guitars. - MP3 Player Accessories. - 12 Volt Power Supplies. - Wire Harnesses. Marine Audio. 600W Peak (300W RMS) Dual 12" Comp Series Loaded Ported Enclosure with 2-Ohm Final Impedance. Kicker Dual 12" Comp DC12 (43DC122). Dual 12" Competition (Comp) Series Subwoofers. Tinsel leads woven into the spider with Kicker's Spiralead technology. 600W Comp RT Series Single 8" Sealed Subwoofer Enclosure w/ Reflex Sub - 2 Ohm. Kicker CompRT TCWRT82 (43TCWRT82). 600 W Single 8" Sealed Subwoofer Enclosure with Reflex Subwoofer. Subwoofer Series Comp-RT / CRT (Kicker).